What Are Determinate and Indeterminate Tomatoes? One of the classifications you will often see on the label of a tomato plant or on a packet of tomato seeds is Determinate or Indeterminate. These terms refer to the growth habit of tomato plants and basically mean bush or vining, respectively. All tomato plants are vines that would sprawl along the ground if gardeners did not stake them to grow upward. If left to their natural tendencies, tomato vines would become a damp, tangled mess on the soil, where they would attract all types of diseases and pests, including the 4-footed kind. But indeterminate varieties will grow much longer than determinate varieties. Determinate tomatoes are varieties that grow to a fixed mature size and ripen all their fruit in a short period, usually about 2 weeks. Once this first flush of fruit has ripened, the plant will begin to diminish in vigor and will set little to no new fruit. Determinate tomato varieties are often referred to as “bush” tomatoes because they do not continue growing in length throughout the growing season. They are generally smaller plants than indeterminate tomatoes, with most growing to a compact 4-5 ft.tall. Pruning and removing suckers from determinate tomatoes is generally not needed since they stop growing on their own. Despite their compact size, staking or caging is still recommended, because they will be supporting a very heavy load, once all of their fruits are set and begin to plump up and ripen. This can put considerable weight on the branches. Many pastes or Roma tomatoes are determinate varieties such as 'San Marzano' and 'Amish Paste'. Some others have been bred to be determinate, so they can be harvested in quantity, all at one time. These include: 'Celebrity', 'Marglobe', and 'Rutgers'. Growing determinate variety tomatoes makes good sense when you want a lot of tomatoes all at one time, such as when you want to make tomato sauce. And if your tomatoes are not determinate, they must be.... indeterminate. What is an Indeterminate Tomato? Unlike determinate tomatoes, that hit their mature height and set all their fruit at once, indeterminate tomato varieties are vining plants that continue growing in length throughout the growing season, which is why you will sometimes see them referred to as "vining" tomatoes, Indeterminate tomato varieties will also continue to set and ripen fruit throughout the growing season, until the plants are killed off by frost. They will give you a slow and steady supply of tomatoes, rather than one large harvest. However, they tend to start ripening a little later in the season than determinate varieties do, because they spend a good amount of time simply growing tall. The majority of tomato varieties are indeterminate, including most heirlooms and most cherry types. Even many dwarf tomato varieties are indeterminate. As long as they get growing longer (or taller) and continue setting flowers and fruits, they are indeterminate plants. Some of the most popular tomatoes to grow, such as 'Beefsteak', 'Big Boy', 'Brandywine', 'Sungold' and 'Sweet Million', are indeterminate varieties. Early producing varieties like, 'Celebrity' and 'Early Girl', are also indeterminate. However since they tend to mature earlier and die back before the end of the season, they are sometimes labeled semi-determinate. Although we tend to stake all types of tomato plants, the indeterminate varieties will need the largest and sturdiest stakes, because they will grow the longest. Indeterminate tomato plants require substantial staking or caging to support what can become a large (6-10 ft. or taller) and heavy plant. Alternatively, tomato plants can easily be grown upside down, as a hanging vine. This eliminates the need for support, keeps the fruit up off the ground and permits the plant to grow in an open manner, allowing sunlight to reach throughout the plant. However they will still be heavy, so use a strong hook and an equally sturdy hanger. Some tomato varieties do better than others, in containers. Here are some good choices. Both determinate and indeterminate tomato varieties have their pluses and minuses. It really depends on what you are going to be using the tomatoes for and also, how long is your growing season. If you want a thick tomato for making sauces, you are better off with a paste tomato and those tend to be determinate. If you tend to eat your tomatoes fresh and want a season-long supply, go for indeterminate varieties. 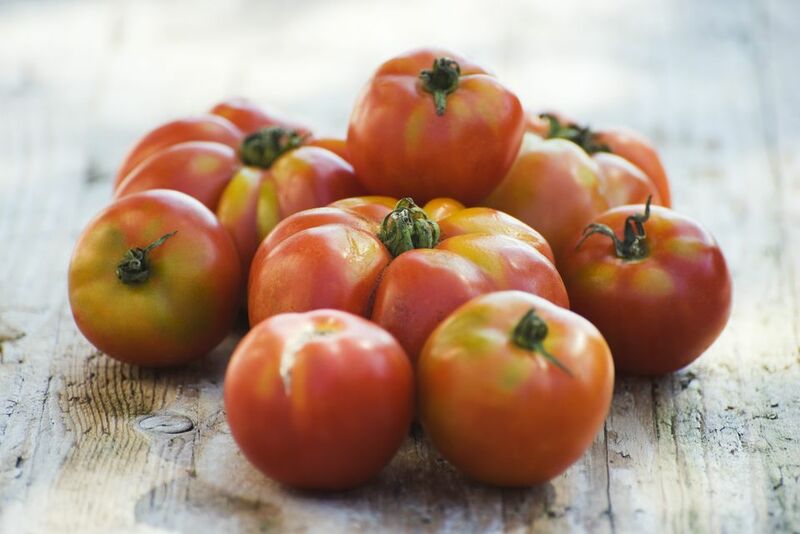 If you live where the growing season is only a couple of months long, determinate tomatoes might be a better growing choice for you. However there is short season indeterminate varieties, like the early maturing tomatoes mentioned above, that would probably ripen for you. Experiment and see which grow best in your area and, of course, which you enjoy eating. How Do You Prune Winter Squash Vines?